So I have my mom’s loom that she bought for my Grandma Orr to use roughly 70 years ago. After my Grandma passed, my mom reclaimed it and tucked it away in her basement. I discovered it in several pieces 5 years ago in my mom’s basement. I decided to ask her if I could have the loom. My summer lake friend, Ginny, helped me assemble it, since I was absolutely clueless. That was just a small part of the deal. Then it sat in my Beulah-Eden Hill, Northern Michigan house, for the next three years, looking interesting AND OLD. When I remarried and moved to WI it was not too much of a project to move it out of the house and into a UHaul trailer to journey on the S. S. Badger across Lake Michigan to Appleton, Wisconsin, my new home. Then it sat in the garage for 3 months, until the threat of snow. We had to take it apart to get it in the back door and straight down the basement stairs. Once we did that, there it sat, waiting to be reassembled, hoping I remembered how. I had a grand basement to redecorate and brighten before the loom’s turn to re-stage itself. Of course that took another year of pondering and procrastinating. Once the basement was done, finally came the loom’s turn. My husband and I put it back together, but found it needed some new nuts and bolds to make it solid again. That required many trips to several hardware shops and machine shops to see if I could find my antiquated carriage bolts that I needed. I never found the exact thing, but I found something that worked. Now the next decision was how to ready the loom and operate it. I found a forum on yahoo called “rug talk”. I read the veteran weaver’s discussion and noted the books that were recommended. For my two harness floor loom, “Rag Rug Handbook” which was out of print, was highly recommended. I found a spiral copy on Ebay. Two other textual resources were “The Weaver’s Companion” and “Learning to Weave”, which I also bought. I also had an Oriental Rug Co. Loom Instruction book from the early 1930’s or 1940’s. So for the next year I read and considered what I had read. Finally in 2011 I found that Kalamazoo, MI had the Great Northern Weaving Warehouse, which would have the supplies I would need to begin weaving. So my husband and I stopped there on our return trip to Wisconsin. The folks there guided me on mulitple color warp, 24 spools of blue, white, taupe, gray, and camel. I explored their selvage room and bought 10 pounds of that to try as weft instead of rags. I bought a spool rack, a loom apron, which my grandma didn’t use, a new reed and heddle hook, and some new shuttles. Equipment was readied, but I still had to learn how to warp the loom. That created more procrastination. 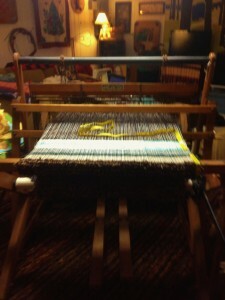 I also wanted to use the remaining warp (yarn) on the beam that my grandmother had last used 25 plus years ago. My mom warned me that it might be rotten or would break. I took the risk and spent hours warping the loom and redoing where I made mistakes. Lots of hours for the meager amount of warp left on the beam. But it was a labor of love. 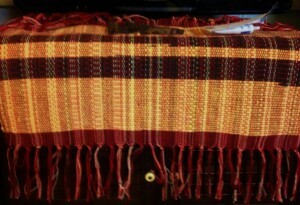 Next I would have to decide on color of weft, the material that goes back and forth between the warp. I am a color idiot, so that took more time. Finally I downloaded a few color wheels to ponder, and then looked at what material I had. My mom and sister-in-law had given me lots of bedsheets that they no longer used. I finally decide on my weft color and began. Bingo, it came to me naturally, after watching my Grandma for several years weave in her basement, and of course her letting me try, too. I have commented that I am “channeling my Grandma”, she would get a good chuckle out of that, I am sure. My mom even said this week that Grandma would really be surprised how much fun I was having. Now, most importantly, why I used the remaining warp left on the beam by my grandma, is to have an actual piece of her wisdom and planning, and to study and learn from it. The warp creates a beautiful and interesting design in the rug. It is a legasy for me, one I will not walk upon but admire. It is the first piece in which I learned how to have consistent edges, and how to weave evenly, and how to end rows and finish the rug. It is not perfect, but was an important first lesson on a small piece, a true sampler. My Grandma had an artistic expression within her, humbly as it was. She made rugs for her family and for her church to sell in their rummage. None the less it was talent and an expression of creativity and artistry that I never considered before. The tattered rugs I have that she made long ago, still have lessons for me. I don’t think she thought much about whether anyone in the family would carry on her love of weaving. But here I am, the next to youngest grandchild, doing just that. Oh Grandma, who would have thought! !